Picture Framing Blog - A Good Frame of Mind: So, What’s New For You? So, What’s New For You? May I shower you with news you can use this April? First and foremost, our new and updated catalog The Essentials Handbook #38 is printed and ready to mail! 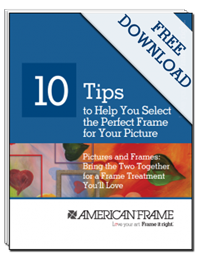 This edition offers 32 pages of resources no framer should be without including our most popular lines of high quality picture frames, mat boards and supplies. To request your copy, please contact us and we will send it out to you promptly. If you are like me and prefer the convenience of the web, check out our online version. For the full product line and current sales and specials, please always check our website. In keeping with the newness of Spring, we are working to keep our product selection fresh and fashion forward. This month alone we are adding over 20 new mouldings to our Basics and Woodtones lines, many of which are certifiably eco-friendly. In Econo-woods, you will find new delicate carved petite frames and sophisticated choices in Bamboo. Be sure to watch for our next featured artist e-tip to be sent the week of April 18th. We’re changing up the format to not only feature the artist’s particular work, but to offer framing suggestions at various price points and style preferences based on the style and medium of the art itself. Our goal is to offer tutorials in an interesting ‘case study’ style format for those interested in refining their skills in material selection and frame treatment design. Next Wed April 13th is the last day to enter our Sweepstakes on Facebook. Even if you’re already a ‘fan’, be sure to sign up for a chance to win up to $300.00 in gift certificates! See details here.